Tim Gary, PE, DC Metro Regional Manager, visited the Loudon County Schools STEM Summer Camp this July to education students and support the continued exposure of young children to the #STEM fields! 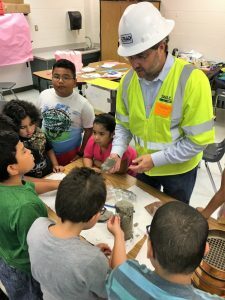 Mr. Gary Presented the basics of Geotechnical Engineering to groups of students in the camp from second to fifth grades. What were students most interested in? Viewing a broken concrete cylinder to show compressive strength! Triad Engineering, Inc. values building relationships with community leaders in the education industry to promote STEM learning, and offer an insight to day-to-day experiences in the workplace. Many staff members from our various disciplines are often seen in area schools demonstrating many of the job responsibilities they encounter each day. If you are an educator and would like to learn more about our staff members offering their expertise, please contact any of our offices directly via phone or e-mail found in the contact us section of our website: www.triadeng.com.